Billy Lewis Jr.My first introduction to Billy Lewis Jr. was watching him on Fox's hit show Glee, during it's final season when Billy came on as "Mason McCarthy," cheerleader and Glee Club member. I loved his character, his voice, and his talent. Then I discovered his original music and felt even more connected to him. Then I found out he was a fellow Long Islander, who was proud of his origins, and I was like, "That's it, I HAVE to interview him." When I heard he was going to be starring in the Off-Broadway spectacle The Portal I immediately dialed his number and lucky for me, Billy answered my call! The Portal is a rock odyssey: part concert, part movie, and part performance. Inspired by Burning Man, Pink Floyd, EDM, and world mythology, The Portal not only entertains but also immerses the audience in a journey of transcendence and empowerment. The Portal follows "Dante" through majestic deserts and alpine mountains as he seeks the beautiful and mysterious "Beatrice" -- while also being pursued by his own inner-demons. Is his quest real? A dream? Or an allegory of our own desire for transformation? The Portal is currently playing at Minetta Lane Theatre (18 Minetta Lane between MacDougal Street and 6th Avenue). Click here for tickets! For more on Billy be sure to visit http://www.billylewisjr.com and follow him on Facebook, Twitter, Instagram, and YouTube! For more on The Portal visit http://www.theportalnyc.com and follow them on Facebook, Twitter, and Instagram! 1. Who or what inspired you to become a performer? My cousin Catherine always did musicals growing up. As a kid I was never really interested in the shows. But I finally caught the bug in high school when my younger siblings started doing theatre with her as well. 2. This fall you are starring in the Off-Broadway extravaganza The Portal, which is part concert, part movie, and part performance. What do you like about starring in a show format like this as opposed to a traditional musical theatre show? I'm having a blast with the rock concert aspect of the show. Instead of having a cast of 20 actors telling the story with me, I get to interact with the Band, the giant LED screens and two amazing dancers. I think Luke Comer, our director, has found a really powerful way to help guide people along this journey. 3. What do you relate to most about your character and what is one quality of his you wish you possessed? I can say that I relate to the "Front Man" quality of my character. Being the voice in the band, having been in a couple bands in my high school days and writing my own music now. I definitely wish I had more of the enlightened characteristics of my role in my everyday life. I definitely still let myself get bogged down with everyday problems and anxieties. But the show is helping me to overcome those and hopefully it'll do the same for the audience. 4. The Portal, follows "Dante" through majestic deserts and alpine mountains as he seeks the beautiful and mysterious "Beatrice" -- while also being pursued by his own inner-demons. What are some of your own inner-demons that you've had to tackle? While tackling them, did you ever try to escape to a mythical place like The Portal? I definitely suffer from anxiety like a lot of people do these days. It's only natural to let yourself get swept with in the chaos of school loans and rent and being stuck in between jobs. I guess my "mythical place" would be when I write. I get to go to place where I can challenge these feelings that I'm having and deal with them in an expressive way. Billy Lewis Jr.5. The Portal also immerses the audience in journey of transcendence and empowerment. How has being a performer empowered you in a way you never thought possible? I can absolutely say that performing has turned me into a more confident person. You learn a lot about yourself on stage, it's a very venerable place to be. And when you're nailing it, it's great and you feel so high up. But when you're not nailing it, and you trip and fall a little...it's those moments you really figure out what kind of person you are. It's how you deal with the pressure in front of people that prepares you for everyday problems that arise in life. 6. How do you feel being a singer/songwriter helped prepare you for this role? It has definitely helped with the commanding nature of the role. Having to keep an entire audience engaged while I'm up there front and center. It's very similar to when I play gigs with my own music. Billy Lewis Jr. as "Mason McCarthy" on FOX's "Glee"7. 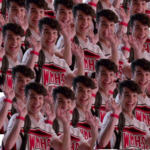 You starred on the final season of Glee as "Mason McCarthy," one of the cheerios, in addition to being in the Glee club. Since you were part of the cheering squad on the show, what is something you cheer for in life no matter what? Long Island! I have a lot of home pride. 8. What were your top three funniest moments to happen on or off the set of Glee? Laura making up lines for "child star" episode. And anything Jane Lynch ever did or said. 8a. Whose music were you so excited to sing on the show and whose music do you wish you could have sung? I was so pumped to sing Queen on the show. It was such a huge honor. I always wanted to do a classic rock song on the show, maybe with Noah. Possibly a Creedence Clearwater tune. 9. In your original song, "History in the making," you sing "So I can put flame to this fire, It's time to start living my life, Set fire to the sky, Now I'm yours." What weren't you doing at the time you wrote this song that you wanted to be doing? How did you get to where you wanted to be? I wrote the song at a time in my life when I was VERY unemployed and very unhappy with where my career was. I wanted to create content for me to exercise my natural talents, which was a ridiculous passion for rock and roll music. 10. On "Call Me Adam" I have a section called One Percent Better, where through my own fitness commitment, I try to encourage people to improve their own life by one percent every day. What is something in your life that you want to improve by one percent better every day? I'm working on smiling more in my life. It's a very simple solution to dealing with negative, unhappy thoughts that plague our minds on a day to day basis. Bad things are always going to happen, we just have to work on how we let it affect us. Billy Lewis Jr. is a New York City based singer|songwriter|actor. 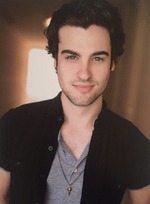 He has been featured in The Who’s Tommy, Spring Awakening and Hedwig & the Angry Inch, as well as the national touring companies of Hair, Spring Awakening and We Will Rock You. In 2014 Billy released his debut EP of original music. All songs are available on iTunes. In 2015 he joined the cast of Glee as "Mason McCarthy" for the sixth and final season of the popular series. Currently he is writing new music with plans to release a record in 2017.